Well, they did it: the Alameda County Fair officially broke the Guinness world record for largest hamburger on Saturday, according to the CoCo Times via A Hamburger Today. 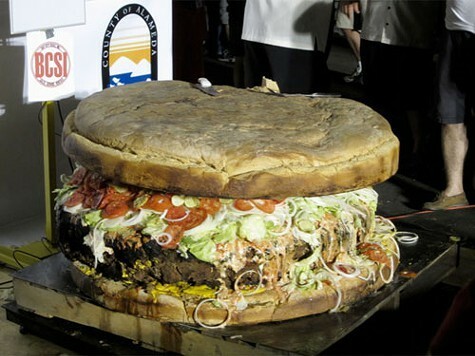 Weighing in at a mind-boggling/vaguely disgusting 777 pounds, the burger contained 110 pounds of bun, twenty pounds of onions, twelve pounds of pickles, thirty pounds of lettuce, and — wait for it — 1.375 million calories. (For a sense of scale, this is equivalent to roughly 2,400 Big Macs). Apparently big fans of irony, the Fair's food team sold pieces of the burger for 99 cents each, with proceeds going to — you guessed it — the Alameda County Food Bank. Inside Bay Area's got a whole slideshow of the prep and cooking process here.